The Crushing of Army Group North 1944-45 on the Eastern Front tells the story in words and images of the last bitter months fought on Russian soil and the battle of the Baltic States that ensued. 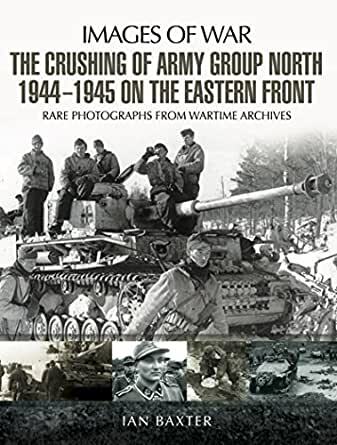 Drawing on rare and unpublished photos it reveals in detail how remnants of Army Group North were driven back to the borders of Estonia, Latvia and Lithuania. In the battles that followed, the retreating German Panzer and infantry divisions were encircled and annihilated. With the remnants were pushed back into East Prussia, and then fought to the death in the last few small pockets of land surrounding three ports of Libau in Kurland, Pillau in East Prussia and Danzig at the mouth of the River Vistula. It was here that the final battle of Army Group North would take place after Hitler ordered his troops to `stand and fight` and wage an unprecedented battle of attrition.